OK, let's set aside the "selling guns to kids" issues -- and make no mistake, this ad is targeted to kids; note the "Show Mom and Dad how you can..." lines. After all, this was still the 1970s, and we didn't have the child safety concerns we do today. But even leaving that aside, who the hell thought advertising that you should fire your guns in the house was a good idea? 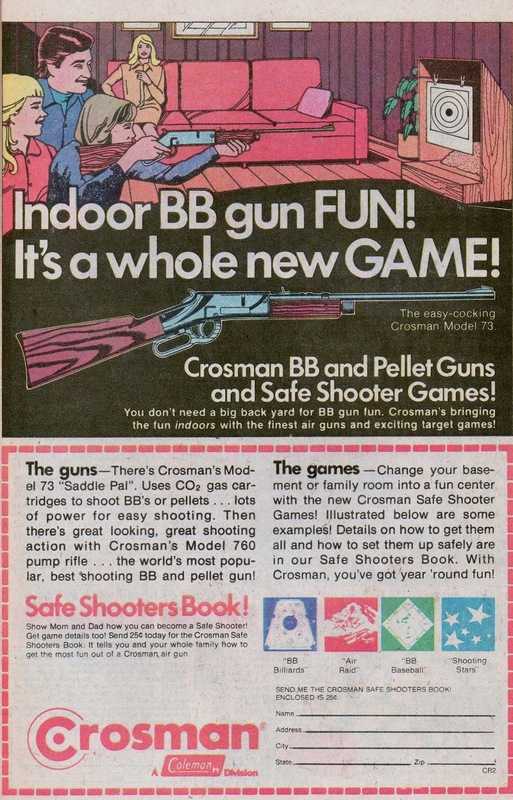 "Coleman's bringing the fun indoors with the finest air guns and exciting target games!" Setting aside the "you'll shoot your eye out" arguements, wouldn't there be concerns of, say, just missing the target and breaking Mom's good dinnerware? Or a lamp? When, in America's gun-loving history, was firing inside the house considered ever considered safe? How does this make any sense? Amazing how comics can act as windows to the social mores of days gone by. Even if the campaign was a complete failure, it's fascinating to see that at least someone felt it would be a socially acceptable idea.